Starbucks-operated La Boulange Cafes Will Close. Starbucks has announced that it will close 23 separate La Boulange Cafes and one Evolution Fresh store in San Francisco / Bay area. Starbucks will close the two La Boulange manufacturing plants also. The Wall Street Journal has the complete story. Pascal Rigo, the founder of La Boulange, will leave Starbucks. I know for myself, and probably many others, we’re left wondering if the La Boulange branding and marketing will slowly fade away from Starbucks stores. I assume it will. The Wall Street Journal article doesn’t really tackle that very question. Two years ago, I attended a special blogger/ media event at the Starbucks headquarters to learn about the direction of La Boulange in partnership with Starbucks. I met Pascal Rigo and truly had a great time. There’s no question in my mind, in 2013 if you’d asked Starbucks if they’d be closing La Boulange stores, and Pascal leaving the company, the answer would have been a resounding “no.” In the spring of 2013, Starbucks sold a La Boulange cookbook called Cafe Cooking at Home. Pascal Rigo founded La Bounage in the Bay Area in 1996. It’ll be interesting to see what changes are coming more generally in the area of food at Starbucks. 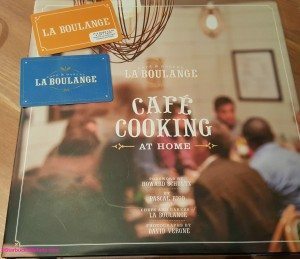 Do you think this is a significant step, closing the La Boulange Cafes? Seattle wakes up to La Boulange bakery treats at participating Starbucks stores. Goodbye Mini Loaves at Starbucks. Welcome Back Sliced Lemon Loaf. Very interesting events but I am not really surprised. Some of the pastries have not been well received and/or overpriced. I will be interested to see what direction SB goes in with regard to new pastries. Was interesting to read about this especially with the canada launch just happening recently. Will be something to keep an eye on for sure. I am very saddened by this. Their food is incredible and their actual locations are a joy to visit. The are wholly different than Starbucks and frankly far superior as a restaurant location. I suspect the culture merge just didn’t work. But the quality of food at Starbucks increased significantly and I am disappointed that their sandwiches won’t come into reality. My location was a test market for some incredible sandwiches and sauces I can’t imagine they would not have gone over well. If you have a chance to visit one of their locations do so and get the bread pudding! Or any pastry. You will be pleased you did. Good! Bring back the old pastries. Great news. Hopefully they ditch them and bring back apple fritters. My kids loved them, but we are not fans of the current pastries are smaller and overpriced. See ya La-fancy pants! Ultimately, Pascal’s mission in Starbucks was the transfer the food business and add day parts where Starbucks would compete with other food outlets. While bakery went well, the successive delays on the lunch platform due to poor performance are what I think sunk Pascal and LB as a part of Starbucks. The vision Howard and Pascal formed was for stores to be selling as many lunch food units as a chain like Subway. That would have been transformative for the company’s numbers, but was a harder nut to crack than anyone foresaw. If he’s free, I’d love to have a dinner with Pascal. In my short time talking to him at an LB launch event, he seemed genuinely in love with life and food. I visited a La Boulange Cafe in North Beach, SF 2 years ago and fell in love with the brand. What gave me a kick was that a local person suggested LB for coffee as “it isn’t Starbucks”. I didn’t try and correct her! On another note i have the orange LB gift card so I’ll be holding on to that as I’m sure it will become very collectible. Personally, since the beginning I have felt a certain tension between Pascal, some of Starbucks HQ folks, and management at the production bakeries that were “converted”. The bean counters (accountants) must have run out of tricks to keep a positive light on La Boulange. I wonder how much this bridge burning is going to cost Stabucks? Will we ever really know? I bet it will cost more than its $100 million base acquisition (that does not include all the changes to production bakeries and distribution system). Doing a quick look through all the fluff announcing the acquisition of La Boulange there is nothing about Pascal only being around for “implementation”, the impression was that he was going to rule the food production. Starbucks PR can try as they might, but I see a less than amicable parting of the ways. Stockholders, demand to know what Pascal’s Golden Parachute is. Not directly to the point of the cafes, but oh, how I hope they get rid of those nasty, gummy frozen pastries they serve now! They are just horrible. I refuse to purchase food at Starbucks until they go back to fresh, local pastries, and have not done so for months now. Hopefully, I’m not the only one. I SO miss the old scones and goodies that were delivered locally and freshly made. Pretty sad when every pastry has to be heated before being edible. YUCK! If I want a pastry from a cellophane wrapper, I can go to 7-Eleven and get one for a third of the price. Starbucks needs to go back to a dedication to quality first, instead of cheap and fast like they have recently. I spoke with our store manager today and he gave me a bit more insight. The Pascal is apparently retiring and Starbucks had no interest in maintaining the cafes. But the La Boulange name and food products will still be owned and very much part of the core of the Starbucks offerings and the food processing centers will remain active. I live in San Francisco and have been going to both La Boulange and of course Starbucks for many years. The La Boulange cafes have always served pretty decent food for a very reasonable price. I’d say the quality went down just a touch several months after Starbucks took over, most likely to cut their costs. Nonetheless, the cafes are usually very busy. The La Boulange-branded goods at Starbucks are like bizarre miniature airport food, institutional cafeteria, or TV dinner versions of similar items at the cafes. Disgusting! They are La Boulange in name only as far as most around here are concerned. I can see why Starbucks wouldn’t want to deal with the cafes. I’m sure the margins for selling pretty good fresh bakery goods are much worse than what Starbucks gets for what they sell in their own stores. What’s sad is that rather than selling this successful cafe chain to someone else to take over, they are shutting it down. Clearly, Starbucks doesn’t want the competition! Is there any word if they will close la boulange in los angeles? One of my favorite spots to eat. Whatever they do. Keep the croissant. This isn’t surprising, but sad nonetheless. Pascal was truly passionate. I wonder if Teavana will stumble next. Something needs to change there. I’m surprised at how active the Teavana replacing Tazo posts have been on this blog. I haven’t come across any store manager who has said their at home tea sales have increased (they’ve all dropped) – and many point to the lack of tea bags (which is ironic because they serve the teas in the stores using tea bags so they’re already being manufactured). I think Starbucks will phase out the La Boulange brand, period, because I suspect that it carries with it negative connotations due to customers’ past exposure to the brand in Starbucks stores. If you place a new product in Starbucks display case, don’t you think that customers would be LESS likely to try it at this point if it were labeled “La Boulange” than not? Unfortunately, I think that’s where we’re at. @Gardel – good article and it has a point. However it also shows Starbucks ignorance. French pastries must be made and sold fresh, they cannot be frozen. Freezing pastries with a high butter content results in an off/flat taste and loss of texture/crumb/flakeness. This could only be compensated for by using a lot of engineered products/chemicals and in this day and age the consumer wants the real stuff. Starbucks does not understand the expense involved in building stores with bakeries. These aren’t just the material expenses but the training and retention of bakers as well as licensing and insurance. Pair these announcements regarding La Boulange and the recent Starbucks Leadership Changes http://starbucksmelody.com/2015/06/22/starbucks-leadership-changes-organizational-moves/ and I see no positive future. Starbucks did the EXACT same thing to Torrefazione, the beloved chain of high-end coffee bars in the Northwest. Promised not to touch the retail locations, turned around two years later and shut them all, devaluing the coffee which did not taste the same and turning it into a supermarket brand. La Boulange’s quality plummeted after Starbucks bought it, some very good items became inedible. I hope they can restrain themselves from purchasing any more small treasures to destroy while salvaging a name to sell inferior product under. It adds insult to injury for those who knew the originals. Welcome to the new Starbucks business model. Actually not so new, been going on for years just becoming more and more evident that the direction of Starbucks is not to truly innovate but to copy and destroy. People will say, but look at Starbucks growth. Sorry folks, it is false growth and the Wall Street players know it but they can also depend on the uninformed and many in the millennial generation to keep spending their money on what they are told to by media. The only people really making money on Starbucks are the players on Wall Street that know when to buy and when to sell, riding the waves. Yes, Dad is no longer a Starbucks fan, just an occasional customer now. Over a year ago when my regular Starbucks lost the last of the long time Baristas that still remembered what the “Third Place” meant I and many old time regulars migrated to the local Indy Coffee Houses that while run by young folk know what a real “Third Place” is. Here is the truth, starbucks and pascal did not see eye to eye. Starbucks changed everything in the manufacturing facilities for the cafes and screwed everything up. Sales declined and starbucks did not care or want to fix it. Pascal was also left incharge of the company but grew more frustrated as time went on. Pascal is not a business operator but rather a baker and had no idea what he was doing. Many mistakes were made and starbucks would rather kill a tradition in SF than fix it. I feel that my shareholder dollars were wasted here and Starbucks should offer a more honest explanation. For those of you that complain about the pastries, these are not the same as the cafes in SF. Those items were made based on SF pastries but had to meet starbucks coloric requirements and had to be made in huge factories all over the country, frozen then distributed. Starbucks just used the name, brand and pascal to make every starbucks store seem like a little bakery. And for the person that said pascal retired, not true! There are rumors that he will buy back a handfull of the cafes and re-brand them. I really hope that happens. As far as surprised, not so much. Like someone said ealier starbucks has a history of this. Cafe Starbucks, circadia, torrefazione, coffee connection, Pasqual and settles best are all examples. I’m sure there are more. Good luck teavana. Shame on Cliff Burrows!